Caiques (pronounced kye-eeks or Kye-ee-kayes) belong to the psittacine genus Pionites. White-bellied caiques comprise three sub-species: Pionites leucogaster, P. l. xanthomeria, and P. l. xanthurus. 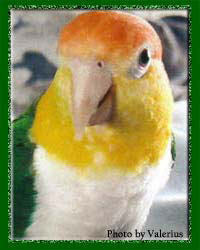 Description: The white-bellied caique is a small parrot, averaging 23 cm in length and 165 g in weight. With a helmet of bright orange feathers, a brilliant yellow chin and snowy white breast, white-bellies are certainly one of the most colorful small parrots. There are color features that distinguish the three white-bellied sub-species. All have white underparts, but some differ in tail and thigh coloration. P. l. xanthomeria has yellow thighs and a green tail. The back and wing feathers are dark green, with wing coverts deep blue. Range: White-bellies are native to Brazil and parts of Peru and Bolivia. They prefer lowland forests near watercourses. Very social, white-bellied caiques travel in pairs or family groups, feeding on rainforest fruits, nuts, vegetation and seeds. Like most parrots, white bellied caiques like to nest in cavities high in the canopy of rainforest trees. These parrots lay anywhere from two to four small white eggs which the female incubates. Incubation lasts around 26 days, during which the female rarely leaves the nest. The male will forage and feed her while she sits the eggs. The chicks hatch blind and helpless and both parents feed and care for them. At about 14 weeks of age the chicks are ready to leave the nest to begin foraging and feeding on their own. Habitat: Like so many species of plants and animals in the region, the white bellied caique is threatened with shrinking habitat, as Brazil is losing rainforest at an alarming rate. The wholesale destruction of habitat has contributed to the decline of countless rainforest species, and if left to continue will surely lead to the extinction of many. Artificial Incubation: Nest boxes are checked daily during the breeding season, which in Florida begins in January and usually ends in June. Eggs are removed by 0900 hours and are weighed, measured for length and width, labeled for species, date and cage number and placed in an avian incubator. The incubator is maintained at (99.9 F) with 50% humidity. Chicks hatch on the 26th day of incubation. Upon hatching, chicks are weighed, color-coded with a non-toxic marker and placed in individual plastic cups lined with soft absorbent cotton. Hatchlings are placed in an avian brooder set at (97 F) and saturation humidity. Brooder temperatures are lowered with chick age, usually in three to five degree increments. Once chicks are feathered, brooder temperatures are set to ambient room temperature. Hand-feeding: Upon hatching, white-belly chicks are fed every 90 minutes around-the-clock for the first five to seven days. The chicks are fed a commercial parrot hand-feeding formula prepared fresh for each feeding. Syringes are used to feed the formula, which is heated to (100-105 F). Growth patterns indicate that within the first five to seven days, a weight gain of 15-20% over a single 24-hour period becomes a benchmark for future development. Upon achieving this daily growth rate, chicks "take off", and weight gains are usually sustained at roughly 15% for the next few weeks. After the first week, chicks are fed roughly every 2 1/2 hours, or whenever the crop is completely empty. After the first four to five weeks chicks should be fed four times per day. Weaning usually begins by week ten, with chicks fully weaned by 14 weeks of age. Feedings are gradually reduced at this time, and dietary additions such as millet spray, banana, soaked monkey biscuits, whole wheat breads, cooked rice, beans and pasta, as well as the full adult diet of seeds and fruits are offered daily. For more information, we found this site which is The Caique Manual a great resource.